Bubble Blobs is a totally new take on the classical bubble shooter gameplay. 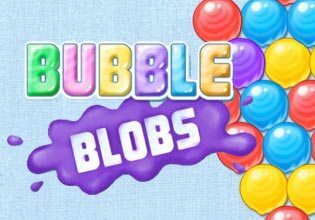 Not only does Bubble Blobs beautiful graphics and a joyful soundtrack but unlike other games of the genre it does not add more bubbles after a certain time. Instead the bubbles are added each time you don't manage to combine at least three blobs of the same color. In Bubble Blobs it can make sense to shoot your bubbles at seemingly unimportant areas scoring a low amount of point just to make sure you receive no penalty. Play Bubble Blobs now for free and make your way through all the 50 levels full of fun and challenges!